Today’s Laptops, Android Smartphones and Android Tablets do offer USB ports which can be used for multiple purposes. Ever wanted your Android device to power a USB fan? 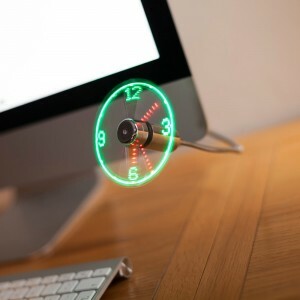 Its not just a simple USB fan, rather it offers appealing LED message to appear in a stylish way. The most amazing part of this USB LED Fan For Android is that it is programmable, indicating you can easily customize the LED Message, and could set up to 8 phrases / messages up to 26 characters long which will randomly appear in the form of smooth animation on fan’s blades. This sort of Android accessory is quite unique yet elegant for marketing purposes and to be offered as a gift to your friends or loved ones. You can either connect this USB LED Message Fan with your Android device or laptop computer. Your Android device must need to have support for USB OTG functionality. Most of the flagship Android devices are usually equipped with USB On The Go function. If you don’t have USB OTG cable (Buy USB OTG Cable from here) Still its better to check your Android device’s user manual or detailed specifications from the device manufacturer, before purchasing this beautiful accessory, whether your Android device supports USB OTG or not. 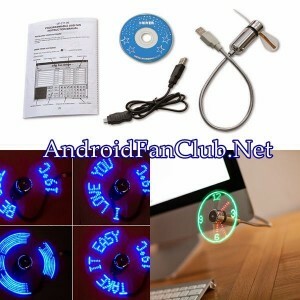 USB Fan’s LED offers three different colors namely, Red, Green & Blue. Blue seems to be the coolest color among the three choices. Blades of fans are made up of flexible plastic in order to keep you protected from any harmful hazard. One flexible plastic blade has got the LED strip which is responsible for illuminating message. Short animation of the message could also be customized, like zoom in and zoom out for opening & closing of the colorful message. 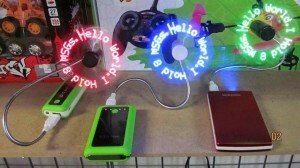 In order to customize the message, you will need to use a Windows Computer, there’s a mini CD that is included in the purchase package, from where you have to install the LED Message Customization tool and then connect your fan with USB cable in order to customize the message of your own choice. 1. LED of fan comes in three cool colors, Red, Green & Blue. 2. Program up to 8 messages and 26 letters in each message. 4. 16″ Flexible Goose Neck and can power from any USB outlet. 5. Software works only with Microsoft Win 95/98/ME/2K/XP/Vista/ 7 / Windows 8 OS. 6. ON/OFF Button & Soft Blades for Safety.